Evolving from a home-based TV Repair service established by a teen from a small suburb in Ohio with extensive background in Electronics and particular interest in tube-based technology, that teen's after-school business venture has matured along with its proprietor. Antique radio, always a favorite hobby since his pre-teen years, ultimately led him toward historic preservation of more-complex vintage technologies. The results are the Amptech Systems Restoration Shop and Parts Reproductions. We're basically a group of friends with a shared interest in Vintage Electronics who have teamed up to advance a shared goal of Historic Preservation of fascinating items from a bygone era. Originally established to also provide Talent Management for my former band in 2001, we are resuming our Talent Management service as of 2018. The year 2018 marks 40 years since my first experience with Antique and Vintage Electronics. My Field Representative / Bench Technician, Dave, has more than 30 years' experience. Dave began restoring Vintage Electronics items at the same age I was when I re-awakened that first 50-year-old radio from decades of hibernation after it was retrieved from the attic of one of Grandpa's Real Estate investments. Historic preservation of vintage electronics such that full functionality is restored and retained by means of comprehensive corrective and preventive maintenance of its original vacuum-tube circuit topology. Just over 20 years ago, I had the great honor of being selected to occupy a Temporary position as Assistant Technician under John Witkoski, who was Service Manager of a local TV and Appliance dealership at that time. One of the first things I learned while assisting Mr. Witkoski during the 1988 Holiday Season was that the Technicians from "competing" Service facilities in the Warren/Youngstown area had established a spirit of cooperation which has shaped my Business Philosophy ever since. Informal weekly meetings at an area restaurant every Wednesday at noon provided an opportunity to discuss case histories and sometimes for one shop to provide a needed part to another on the agreement that the receiving shop order the part to replace the one from the source shop's inventory. The receiving shop got to finish the repair sooner due to not having to wait until the part being ordered actually arrived, and the source shop would almost always have the replacement that was ordered back in stock before they themselves needed it for a repair. I would love to establish a network of cooperating shops across the nation and/or around the world. With a proper Database posted on the Web sites of multiple shops, collectors on the West Coast who found this site first would know about shops in their area while collectors in the Midwest who found a West Coast shop's site first would find me. Why should our clients ship their vintage sets 3,000 miles for service when a quality shop may exist within 300 miles? Owners of other Restoration Facilities are invited to email me to discuss participation. Photos of Service Bench(es), List of Test Equipment, Years Experience, Location, etc. would be helpful. Under the terms of my listing in the Antique Electronic Supply catalogs, however, I may only list Service Facilities whose linked Web sites do not explicitly advertise NOS Tubes and/or Parts for sale which would make such a shop a "competing" vendor. Aside from that one stipulation, my invitation is extended to anyone meeting criteria of ten years' minimum experience and having at least one reasonably well-equipped service bench. I am deeply saddened by the demise of the US consumer electronics industry. Although I'm barely old enough to remember when products such as radio and television receivers were produced in American factories by American workers. Some of my earliest childhood memories are of television. At home, that was an American-made Sylvania black-and-white set bought new in about 1967. My grandparents' three 1966-vintage American-made Zenith sets were the first color sets I had seen. Those sets continued in daily use well into the late 1980's. How many $99 imported sets will last 20 years or more? I believe that America has the best workforce in the world and that we can and should work hard to reclaim a significant share of the global market. Restoration of antique electronics is, for me, historic preservation of artifacts of a bygone era and a tribute to American inventors who created the technology, American entrepreneurs who built the manufacturing facilities and to American workers who made a living in those factories. The displacement of honest entrepreneurs by dishonest plutocrats during the past few decades disgusts me. Had the founders of RCA, Zenith, and other firms known what the sale of their companies would bring, I suspect that those individuals would have fought long and hard to retain control of the firms which they created. Roy Disney has expressed his disgust at the results of his brother's company coming under the control of persons outside the Disney family. LET'S BRING OUR ELECTRONICS INDUSTRY HOME AGAIN!!! I know I can't be the only one who's tired of cheap throw-away devices that just barely survive through their warranty period. I'd rather pay more for quality equipment that will last 10 years than replace cheap junk equipment every year for 10 years (do the math and the cheapie models cost more in the long run). Even if it's "obsolete" in a year because the new ones have new features, there's always someone who can't afford a new one, doesn't care about having the latest bells and whistles and will pay enough for a good used one to offset my costs for upgrading when adding some new features & functions available only on new equipment makes sense. My goals include the creation of new American manufacturing jobs through expansion of my company's array of products and services. Some years ago, someone started a vicious rumor that "women were discriminated against in the workplace" quite possibly as the old "divide and conquer" strategy. The truth is that women were often the first chosen for high-wage skilled assembly work. Am I in the minority these days, in noticing that the artificially-created "battle of the sexes" has done far more harm than good for both men and women? What ever happened to the concept of teamwork between men and women? 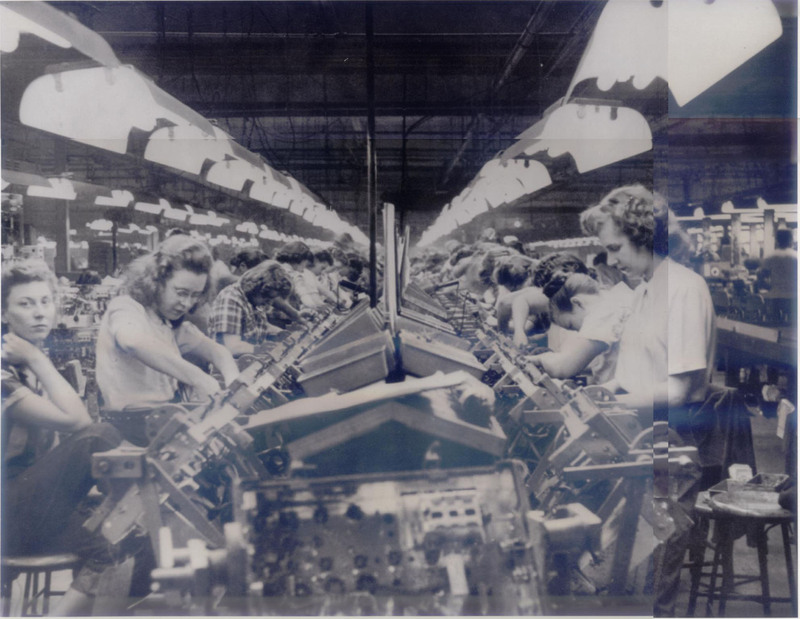 The photo below was a gift from Jamie, and clearly shows the all-female assembly team at the Capehart factory in Capehart, Indiana. So much for that old line about women being forever sentenced to the typing pool. Back then, also, families had the luxury of deciding for themselves whether to be a single-income or two-income household. Today, two incomes are virtually mandatory for survival of families. Worse, the two-income families of today depend on incomes from low-wage, dead-end jobs in retail and fast-food formerly held by high school and college students. If the American Dream is to remain within the grasp of families, if a strong Middle Class is to continue to exist, America must stop permitting our jobs to be exported. When adults must compete with teens for the same low-wage jobs, everyone loses as the Middle Class plunges headlong into poverty. During my early childhood, both of my parents had promising careers in different divisions of the same Automotive corporation. Both of my parents could have continued those careers, but the choice was made that one income was sufficient to meet our needs and that my brother and I would benefit far more from having one parent at home full-time. Either my mother or my father could have chosen to be that full-time parent, but my mother ultimately chose to be the full-time parent, putting her career on hold. Some years later, after my brother and I had graduated high school and enrolled in college, my mother entered the workforce again at a finance company which had been a spin-off of the factory where she had assembled car wiring harnesses 20 years earlier. A few years later, my father retired from the auto and van assembly facility. That's teamwork in action.